2 Where do carnivores get Vitamin C? 3 How do you get other nutrients? 4 Does red meat cause cancer? 6 What about rabbit starvation? 7 How do you lose weight on an all meat diet? 8 Isn’t beef production terrible for the environment? 9 Why should I try a diet that makes people feel terrible? 10 How do you cook a steak without oil or butter? 11 Why would anyone do this? How can you suggest that someone with IBS remove something that actually prevents constipation? First of all, many people don’t eat fiber for many digestive reasons, not only for IBS and IBD. Most of you know that IBS is very broad, since it’s simply a catch-all category for non-specific digestive problems. Some people have constipation (IBS-C) and some people have diarrhea (IBS-D). Other people have both, because the world is truly an amazing place. Despite nutritional dogmas, upon further inspection, fiber is non-essential, and may not always be beneficial. If you go to your doctor and they put you on a gut improvement protocol – nearly all of them will remove fiber. Oats have been shown to lower cholesterol, but other types of fiber have been shown to have little to no effect. Those of you who have had success treating your IBD or IBS using the FODMAP diet will recognize fructo-oligosaccharides, which are the F and the O of FODMAP. [/note] on cholesterol. Otherwise, there has been no evidence linking fiber to a reduced risk of heart disease. Studies have repeatedly shown that fiber has no link to the prevention of constipation, or that it alleviates symptoms of IBS. Despite believing that the removal of fiber was a good thing for many people with conditions such as IBS (and even IBD), I personally assumed fiber would still help a healthy body prevent constipation, but research in the last few years has actually proven the opposite. Fiber has been linked to causing constipation, with those who remove it having a drastic reduction, and those who carry out a high fiber diet becoming even worse. Let’s put it this way: Fiber is said to guide and assist problematic foods to move through your bowels more easily, but have you ever found pieces of steak in your stool after eating a simple steak? Where do carnivores get Vitamin C? Shouldn’t carnivores worry about scurvy? Somewhere between 20 and 50 million years ago our ancestors, the simians, lost the ability to synthesize Vitamin C. It is a rare mutation, that very few other species have and it is unknown what evolutionary purpose the loss of synthesis serves. If recent assumptions and research is correct, it could have been an issue of diet changes rendering it unnecessary. There are several reasons we do not need Vitamin C, and most of them involve the state of ketosis and changes to our bodies that occur when we eat ketogenic and zero-carb diets. In 2005, Fred and Alice Ottoboni studied research about Vitamin C and the immune system and made citations backing up the idea that Vitamin C and glucose are quite similar and follow the same metabolic pathways in the body. In keto and carnivore, glucose in minimized or eliminated, and glucose inhibits our bodies absorption of Vitamin C. We need drastically less when glucose is not present, and our bodies need less than 10 mg of Vitamin C. As we mention in one of our other articles on the carnivore diet for IBS and IBD, that’s less than four skittles. In ketosis, our bodies need less Vitamin C, and many of the functions it is needed for can be carried out by other compounds, such as glutathione (an antioxidant) and uric acid. Using uric acid for these function also helps prevent uric acid buildup, which can lead to other health complications. Low carb diets also produce other antioxidants to fill the gap and further reduce our need for Vitamin C.
L. Amber O’Hearn posits that meat does contain Vitamin C.2 She cites examples of sailors in the late 19th century sometimes using meat as a stand-in for lemons and limes, as well as the Inuit. She also managed to find a somewhat obscure report that lists the Vitamin C content of several animals, which contained more than sufficient Vitamin C to subsist on even a high glucose diet. But since the USDA does not measure Vitamin C content, and does not require it to be listed on products, we have no evidence with which to verify. Trace amounts of Vitamin C, along with collagen, likely exist in meat, and when a low glucose diet limits our need, it’s possible that those amounts are more than enough. O’Hearn also reported that the only case of scurvy that has occurred on a zero carb diet came from eating what I’ll call the “only pemmican diet” for a year without becoming completely bored. Here is a link to more of O’Hearn’s research and analysis into Vitamin C and zero carbohydrate diets. How do you get other nutrients? What will replace the nutritional value of fruits and vegetables? On the carnivore diet you should be concentrating on consuming high quality and high fat cuts of meat, which provide considerably more nutrients than lean or processed meat. You can also eat seafood, organ meat, bone marrow, and perhaps dairy to ensure you are eating a healthy diet. Organs and marrow will provide you with minerals such as calcium, magnesium, phosphorous, and potassium. But high quality red meat alone contains higher amounts of nutrition than other foods, with a perfectly acceptable amount of amino acids, fatty acids, iron, B vitamins, and choline. It’s important, especially when starting out, to get enough salt and electrolytes. Remember that drinking more water will remove electrolytes through extra urination, so be sure to get your salt. As with the steak you should be sprinkling it on, higher quality salt will give you higher quality nutrients. Sodium is also potassium sparing and will help you maintain a normal potassium range. Speaking of potassium, Salmon is an excellent source. Most people suffer from a magnesium deficiency, if you’re worried about it or are already deficient, seafood is a great source of magnesium. Magnesium is also found in high quality salt. You can take magnesium supplements, especially early on in the diet, but that is not recommended because parts of the pill may cause problems with the diet, and absorption through supplements is much less efficient than other methods. The body already stores large amounts of calcium and meat and dairy will provide more than enough. Will all the red meat, plus the lack of antioxidants, cause a higher risk of cancer? There have been no long-term studies of the risk of cancer for carnivore keto practitioners. There are several anecdotal long-term carnivores, like the Anderson family who have been eating zero carb for 20 years, but no direct research on long-term effects. More research needs be carried out, but it’s difficult to study if the blame lay in diet or happenstance. The link between red meat and cancer has been known for some time, a 2015 study from the International Agency for Research on Cancer (IARC), part of the WHO, recently declared it official. The study was particularly popularized for also finding a correlation between cured meat and cancer, which triggered a twitter panic among bacon lovers.3 The implication that many people took from the study, was that it classified red meat in the same category (group 1) as smoking. However, group 1 status does not imply that red meat carries the same risk of cancer that smoking does, but that we are certain that they are correlated, with no statement about the risk. Red meat will not make you as likely to develop cancer as smoking, but they have both been proven to do so. The correlation is significant for esophageal, colorectal, liver, and lung cancer, but not breast or prostate cancer. The Carnivore Diet allegedly reduces your risk of cancer significantly, due to changes in metabolism weakening cancer cells by a reduction in glucose, and changes in intestinal permeability. If you are worried about the carcinogenic properties of red meat, be aware that when cooking meat at higher temperatures, it produces more carcinogenic heterocyclic amines (HCAs). In addition, polycyclic aromatic hydrocarbons (PAHs) are present in flames while grilling and broiling meat. For those of us who suffer from IBS, HCAs have been directly linked to colorectal cancer, as well as colon tumors and polyps. To cut down on HCAs in cuts that require longer cooking times, you can pre-cook your meat in the microwave for a minute, drain the juices, and then cook through proper methods. It’s also recommended, in general, not only to lower HCAs, that you cook your meat on lower heat over a longer period of time. To further reduce the risks, you can eat more fish. This is certainly a risk, perhaps the biggest risk, on the carnivore diet, but it’s hard to know for sure. If a zero-carb lifestyle puts potentially life-threatening IBS or IBD into remission, you probably agree that a small risk is more than worth it. Actually, many diabetics have had significant success with low carb diets, and it is often prescribed as a solution, so is a high carb diet. Steve Cooksey, author of “How to Reduce Blood Sugar,” began a typical 30-day experiment going full carnivore after a friend called him a “sissy carnivore” for being on a low carb diet. His starting blood sugar generally sat around 70 and 80. Naturally, it was a lot easier for him to skip the adaptation period, since he had already been on a long term, low carb diet for nearly a decade. He considers eating more meat to be the more notable change in his diet to eating no carbs. After 30 days he continued the diet, and in an update at four and a half months, he saw his average raise above 80, but with some extreme fasting outliers around 60, and plans to drop that further. Other carnivores have shown significant drops in their insulin levels, with glucose remaining stable and perhaps a bit higher. Carnivores who have gone on the diet after experiencing a raise in glucose after being prescribed lean protein, high carb diets have seen their numbers drop back into normal ranges for years. However, a 2018 study had findings that increases in consumption of meat could be linked to nonalcoholic fatty liver disease and insulin resistance. In addition, many experts warn that diabetics taking regular insulin may have their glucose drop from excess carnivory. Will eating so much meat cause protein poisoning? The carnivore diet is a zero carb high fat diet, not high protein. Rabbit starvation is caused by a lack of fat in your diet, not an excess of protein. One of the most important principles of carnivore is to consume higher fat meats than lean meats, such as chicken breast. How do you lose weight on an all meat diet? How do you account for people who have reported little weight loss, or even gaining weight? The goal of the carnivore diet is not to lose weight. While researching this article, most reports mentioned losing weight vs gaining it, but that could easily be confirmation bias. Despite having the word diet in the title, the zero carb diet is not a diet, it is a lifestyle. If you’re approaching it to lose weight, you are on the wrong diet. If you’re going carnivore to attempt a reduction or recovery from complications with IBS, Crohn’s, UC, or pancolitis; or the other general benefits reported and associated with it, then it might be worth it. To reiterate, the goal of the carnivore diet is not to lose weight, it is to improve your lifestyle and mitigate the symptoms of IBS and IBD. Isn’t beef production terrible for the environment? Are there concerns about livestock, and even dairy, not being sustainable and increasing global methane levels? Yes, that is absolutely a concern. It can’t be stated enough, our articles on the carnivore diet are not advocating zero carb over any other diet, whether that diet be high carb, low carb, all meat, no meat, or anything else. There are valid concerns about the effects of raising animals for meat (and even dairy) on the environment. Lab grown meat may finally make it to market, if not a farmer’s market, soon. Imagine a future where we can order any type and cut of meat that you want (stretch goal, what kind of grass your artificial cow was raised on) at a restaurant or online. Wierd, I know, but if you think that’s disgusting, remember that people eat hotdogs. Why should I try a diet that makes people feel terrible? I tried the Carnivore diet for a week or so and had a terrible experience. It’s always surprising how many anti-carnivore pieces base findings on how terrible an experience they had, and that they spoke with dieticians and doctors who basically said ‘I could have told you that.’ Many of these attempts are disingenuous, and the authors unknowingly or deliberately try the diet for a week or two before quitting. They often don’t even try to follow the guidelines, by eating things like beef jerky or Slim Jims, and make no effort to understand their instructions. The adaptation period of both carnivore and keto generally takes anywhere from two to six weeks, although many report three or four. Many of these experiments begin with full knowledge of the “Trough of Despair” and cite it regularly, even reporting how terrible they feel and the diet clearly does not work. They barely even lost weight! The “Trough of Despair” or “Keto Flu” is real, and the most important step to making the carnivore diet part of your lifestyle is adherence. And for our purposes, IBS, Crohn’s and ulcerative colitis, those two to six weeks are nothing compared to a lifetime of pain. 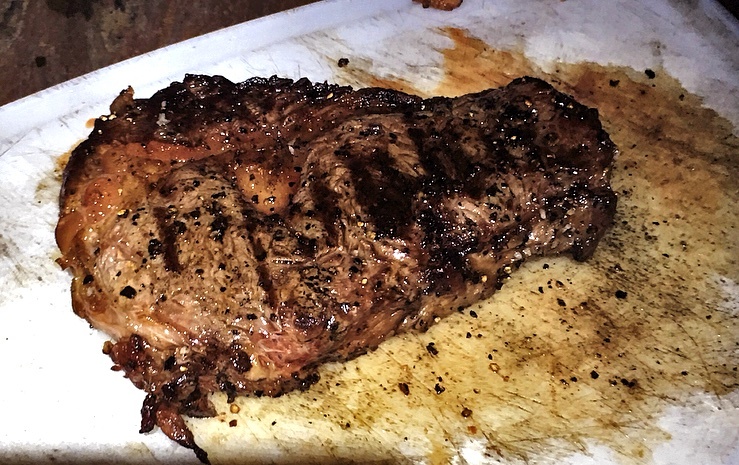 How do you cook a steak without oil or butter? You don’t just eat charred or raw meat, do you? You use animal fat and lard. The goal of this website, and it’s articles, is to offer potential relief of digestive disorders which otherwise have no known cause or cure, such as IBS and IBD. There are valid concerns about the effect of livestock on the environment, and it is unlikely, but there could be potential health concerns. Make sure you monitor your body as you progress, and speak to a professional about any particular issues. Be warned, it is unlikely that professional will be supportive of your decision in general, for valid reasons. But if you’ve gotten this far you are probably already comfortable with that. That being said, there are mental and physical advantages that have been reported by countless individuals over a period longer than ten years, as well as a growing body of research pointing to effectiveness on general health, IBS, and IBD. By the way, this is something that many people don’t want to hear, but bacon is contentious in the carnivore community. I really wanted to stick to carnivore diet for my ibs and other issues, but it make my constipation worse. Fats seem to be hardest for me to digest and red meat would sit like a lump in my lower belly. Any suggestions on what could be the issue.I took hcl and digestive enzymes with ox bile. Hi Kiley! How long have you been on the diet? Constipation is completely normal during the adaptation period, which is not unheard of to last even longer in some people. You’re doing the right thing taking ox bile, and this might seem counterproductive to that, but perhaps try increasing your fat content a bit. And make sure you are fully hydrating – which could mean more water than you think – but don’t drink TOO MUCH. Just be sure to keep a balanced carnivore diet. Are probiotics effective for ulcerative colitis and Crohn’s? We’ll talk about about the role of bacteria in gut health, gut dysbiosis, the role of probiotics, and the best probiotics for IBS and IBD.